Bill McKibben, author and co-founder of the global grassroots climate activist movement 350.org, kicked off the “Do The Math” tour Wednesday before over 2,000 people at Seattle’s Benaroya Hall. 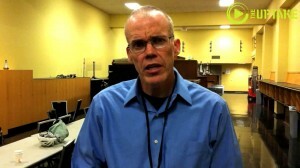 Before taking the stage, McKibben gave this exclusive interview to The UpTake’s Leif Utne. The 21-day, 21-city tour through college campuses, churches and synagogues nationwide will highlight the magnitude of the threat that fossil fuels pose to a livable planet, the opportunity Tuesday’s election results pose, and a bold new strategy to hit the fossil fuel industries where it hurts — including boycotts, blockades, marches on oil companies’ shareholder meetings, and a new Fossil Free Campus divestiture movement modeled after the anti-Apartheid movement of the 1980s. Unity College in Maine became the first college to pull its stock from all fossil fuel companies. “As Maine goes, so goes the nation,” says McKibben. The tour kicked off just one day after Barack Obama’s re-election to the White House for a reason. “Last night (during his victory speech) President Obama broke his campaign-long climate silence and mentioned it at the end of a sentence, and suddenly everyone was on their feet cheering,” McKibben pointed out. Twitter stakeholders could commission a study to see what the company would look like as a user-owned cooperative. About 100 people gathered outside Senator Klobuchar's Minneapolis office asking her to vote against Donald Trump's cabinet appointees who deny that climate change is real and man made. This is a graphic reminder of why environmentalists are opposed to the Keystone pipeline. The company responsible for the largest on land oil spill in the US can't guarantee it won't happen again.